This doesn’t happen in other cities? 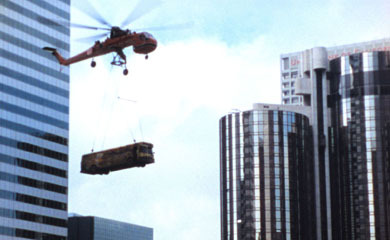 Go Go’ers, it’s a great weekend to love Los Angeles: on screen, on foot, in a train (station). The weather is starting to cool off. You’re downsizing your sunscreen’s SPF. Somewhere, a leaf is turning from green to…less green. It’s pretty much all you need to crush hard on the City of Angels. Why do the haters hate Los Angeles? Maybe it’s because of Hollywood’s love/hate relationship with itself. A decade ago, director Thom Andersen created Los Angeles Plays Itself, which celebrates the city while decrying its flawed representation on the big screen. Originally intended to accompany a lecture at CalArts where he’s a professor, Andersen never got permission to use the 200+ film clips assembled by editor Seung-Hyun Yoo into a “video essay”; as a result, the film was never officially released and is rarely screened. On Friday, Cinematheque is screening the World Premiere of the remastered and re-edited documentary to coincide with the 10th anniversary of the film’s premiere at the Toronto Film Festival. At 170 minutes, it’s a double feature of visual delights and combined with the post-screening Q&A, will remind you all over again why you love Los Angeles. Bring all the haters you know. If you’ve been to any of the Chinatown Summer Nights, you know the community throws a great party. Every bakery in Chinatown will provide complimentary moon cakes for public munching as well as sweets to the dessert-eating contest for sugar fiends and/or the competitive. Look through Griffith Park Observatory telescopes to find the Jade Rabbit that lives on the moon, shop the Asian night market on Bamboo Lane, play baccarat at the outdoor lounge, and watch a capuchin monkey. Go Go’ers, please don’t touch the monkey. Want to get up close and personal with Chinatown cuisine? Karen Mack of L.A. Commons , the organization that leads cultural walking tours through L.A.’s diverse neighborhoods, hosts Full Moon Over Chinatown: a pre-fest, sip-and-sample spin through a curated batch of culinary hot spots at Far East Plaza. 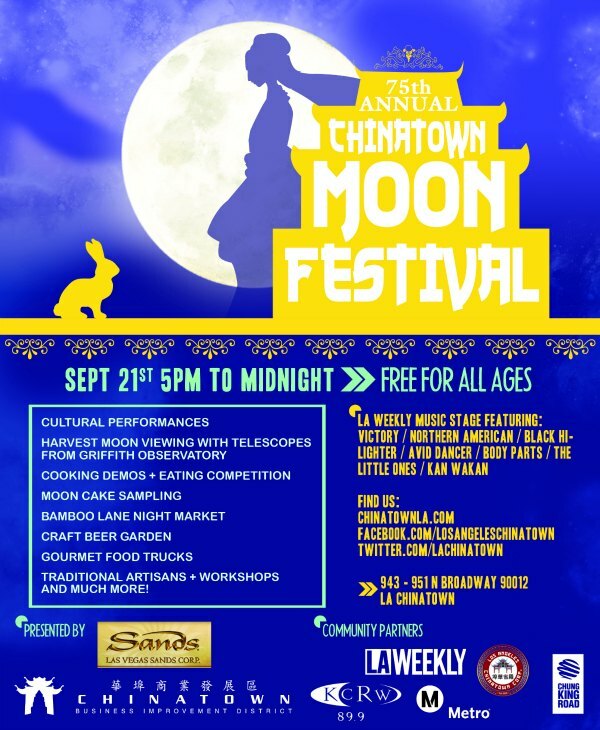 Meet chefs of local restaurants, try exotic specialties as well as unique variations of traditional dishes, and check out local breweries with a complimentary souvenir tasting glass before ending up at the Moon Fest for more dining and drinking as well as dancing. Please, no moon cakes for the monkey. Yes, you want to drink beer at the Union Station Ticket Room. L.A. Beer Week kicks off tonight with events all over the city including a Ruhstaller pig roast at King’s Road Gastropub, a Meet the Brasserie D’Achouffe brewer/three-course dinner at Steingarten LA, and The Right Brews: the first of a four-night beer exploration at Story Tavern, tapping Cask, CO2 & Nitro versions of five different Eagle Rock Brewery beers with ERB’s Jeremy Raub and Ting Su. And that’s just the first night. To celebrate their 5th anniversary, the L.A. Beer Week founders are throwing a midday Gala Opening on Sunday at the Union Station Ticket Hall, which is usually closed off to the public. For a second time this weekend, lucky you. For four hours, hops-loving train hoppers (and well, everyone, really) will enjoy small bites and unlimited 4 ounce pours from 50+ brewers in the jaw-droppingly gorgeous Art Deco room. Ticket availability is limited, which translates to smaller crowds and more opportunities to chat with brewers but means you’ll want to move fast to get in on the brewery bash. And for your designated driver? Take the A train.